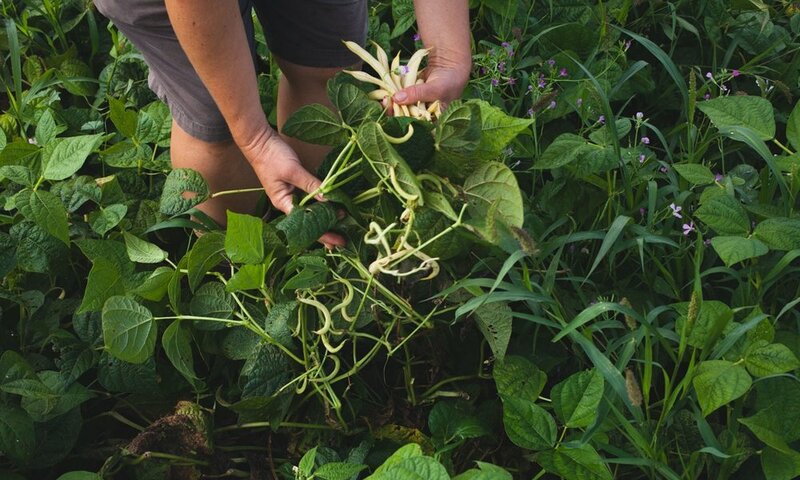 Our goal is to recapture the flavor of the home garden by sharing the seasonal variations of carefully grown, hand-tended food. 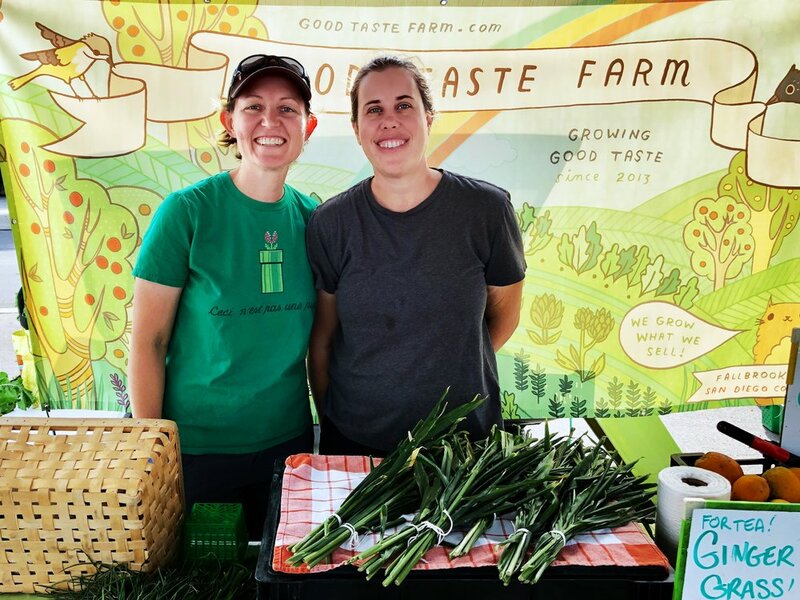 Good Taste Farm is owned and operated by Sarah and Kris in San Diego County, California. Sarah and Kris got interested in cooking, then got drawn into the world of heirloom vegetables. They wanted to taste all of the fruits and veggies they learned about while exploring new cuisines and reading seed catalogs. They immersed themselves in the study of agriculture and the natural world, attending the Eco-Farm conference in Northern California. They visited greenhouses in the Netherlands, learned about self-reliance and ethnobotany, ate their way through Belgium and France, absorbed the words of Alice Waters, Julia Child, Rosalind Creasy and Eliot Coleman, and read lots and lots of cookbooks. After honing their farming skills in their home garden, they expanded to a large community garden space and later did a "test-run" selling their harvest at the City Heights Farmers Market for one summer, prior to officially starting the farm in 2013. They now sell direct online and at the Hillcrest Farmers Market in San Diego, to artisan food makers, breweries, and to local institutions. Sarah studied sustainable agriculture and worked in natural resources management, assisting hundreds of farmers and landowners in conservation practices over thousands of acres of farmland, forests, and land restoration projects. She combines an interest in science, art, and ecological principles to her farming practice. On the farm, you will most likely find Sarah starting seeds or tending to basil plants. Kris is a keen observer of the natural world. She honed her observational skills of nature through sketching animal and insect behaviors, especially birds and spiders. She uses her knowledge of nature and design as a guide to growing sustainable food. On the farm, you will most likely find Kris harvesting citrus or weeding around the apple trees. We recognize that all farms are different. At our current location, we strive to use farming practices that make sense from an environmental and ethical standpoint. In San Diego County, our main concerns are water availability, soil erosion, climate change, loss of open space, invasive pests, and high land costs. Our approach to farming is best described as sustainable. We want to explore all solutions to growing in a responsible matter and not be locked into counterproductive practices, such as using less specific pest controls, using animal-based fertilizers, or limiting our seed variety choices. We value being flexible in our approach. We think it's is imperative to use as little land as possible, disturb the soil as little as possible, and to grow in the most efficient way we can out of respect for the space we are utilizing for our farm. We use hand-farming methods that allow us to plant multiple crops in one area because we do not have to conform to the size of a tractor implement or a tillage schedule. This means we can do things like plant lettuce and onions at the same time in the same row by hand, then harvest the lettuce and leave the onions in the ground to finish growing--something that can be difficult to do in a mechanized system. We take two radically different approaches to our production at the farm. Our intent is to use the method most appropriate to each crop, and sometimes we even grow the same crop under different growing practices. We believe diversity in our farming practices and ability to be flexible, such as in ecology, provides the most robust and resilient system. One approach is an outdoor soil-based system for our fruit trees and vegetables utilizing integrated and polyculture methods. For example, every other row in our apple orchard is planted with something other than apples, such as goji berries, pomegranates and mixed vegetables. The citrus orchard has single varieties of trees bordered by other types of fruit trees like macadamias, avocados, and cherimoyas, with the occasional native oak tree, laurel sumac, wildflowers, or cactus plant growing in the mix. We manage our irrigation in the field to prioritize minimizing waste. With captured rainwater and recycled filtered water delivered through drip and micro-sprinklers, we conserve water by efficiently getting the plants water when and where they need it, to produce flavorful fruits and vegetables. We utilize non-animal based composts, crop rotations, fertilizers, and mulch to provide the soil the organic matter and nutrients it needs to support plant growth. Our other growing approach is a modern, climate-controlled greenhouse to grow crops like basil, tomatoes, lettuce, cucumbers, and specialty seasonal items . In the temperate, subtropical climate of San Diego, greenhouse growing is an environmentally responsible way of farming--using less water and less land to grow more food. Because of our proximity to the ocean, the mild weather and naturally high light levels make this location optimal for greenhouse growing. The greenhouse is cooled through a combination of ventilation, fans, and cooling pads. It is warmed by capturing heat energy of the sun and retaining it in the greenhouse's double-walled insulated covering and efficient computer-controlled heaters. We further optimize this system by growing vertically based crops like tomatoes and cucumbers on trellis systems, and by growing lettuce and basil in vertical-based tower systems, using less land and disturbing less soil than conventional growing. By growing certain plants in a greenhouse, we can provide these crops year-round, reducing the need to import them from other locations. Our intent is to use seasonal cycles to our advantage, allowing natural pest/predator relationships to manage the most common pests like aphids, whitefly, and caterpillars. We time the planting and harvesting of our crops to avoid predictable pests, rather than fighting through a pest problem with excessive pesticide use. We also allow for a certain amount of habitat for predatory insects, like leaving celery to flower to attract beneficial wasps or not harvesting or removing a plant because we want the ladybug or lacewings eggs on it to hatch. We apply the principles of integrated pest management, which includes only using a pesticide when absolutely necessary (which we strive to completely avoid), encouraging beneficial insects with habitat or by supplementing natural predatory insect populations with ones we release, or simply growing varieties that are resistant to pests and diseases we can anticipate having issues with. Because we use mostly hand tools and have limited hours in the day, weeds are our most troublesome pest. They compete with our crops for water, prevent them from getting light, and sometimes attract insect pests or vector plant diseases. In the field, weeding is a never-ending task. We have resisted using flame weeders, mechanical tillage, and single-season plastic sheeting because we do not feel they are a good fit for our style of farming at this time, even though they work great for others. Instead, we continually improve our weed management by using wood chip mulch produced on site from tree trimmings and scrap wood, multi-year landscape fabric, lots of string-trimming, long-handled hoeing, raking, cover cropping and even hand-pulling. We do a lot of intercropping, where we plant a crop that matures at a different time than the main crop. For example we might put in some radishes next to swiss chard plants--by the time the radishes are ready to harvest the swiss chard will have shaded out the area where the radishes were without allowing any weeds to grow in that empty space that would have stood between the swiss chard. We have also started planting low growing plants like herbs and squash around shrubs and trees. Instead of having to constantly weed, we can harvest some herbs or let the squash vines ramble through the tree rows. Weed control is an area where greenhouse growing is a great advantage. The resources we use in the greenhouse always go to the plant because weeds that show up there occasionally are easy to control. Proper harvesting and handling of our crops is essential to produce our high-quality, garden-style produce. We utilize the principles of safe handling and sanitation measures, such as hand-washing, gloves, and clean surfaces for sorting and cleaning our produce. We use drinking-quality water for all of the washing and packing of our produce. Perishable items are cooled and stored at the proper temperature. Our produce stands out for its high quality. We currently do one farmers market per week and the items we sell there are harvested specifically for that market. Our produce does not go from one market to another. For example, if you are buying basil at our market, it has been picked and packed to be at its peak freshness, flavor, and nutrition. We carefully clean and pack our produce so that it will be a pleasant experience for our customers. While we do not get too hung up on cosmetic defects, we want preparing and eating our food to be a positive experience, so we sort and pack our food so that it will maintain its quality and freshness as long as possible and be free from dirt or debris to make it easy for your to give it that final quick rinse or prep before eating. Selling locally is an important way to reduce food waste because it allows for us to do things like harvest items too big to fit in a box, too fragile to travel in a bumpy vehicle, or at a stage of ripeness that while delicious, wouldn't be able to sit for weeks in a store. We strive to be reasonable with our expectations about how food looks. We also want to surprise and delight people with uncommon produce. Many times you will see us bring odd sizes or shapes of items to the farmers market, or we might offer fruits and veggies that have some cosmetic damage. We enjoy selling at California farmers markets because it allows us to bring foods that would not "meet grade" in a typical commodity setting. We recognize these standards are important for indirect methods of sale like at grocery stores or when something needs to be shipped a long distance, sight unseen. Selling direct means that we can tell you that a few slightly unripe tomatoes will make your sauce taste great or that fresh picked citrus tends to be quite firm because it has not been coated in wax to make it withstand decay for months of storage. Reducing food wastes starts first with careful crop planning. While we are nothing like a factory, we apply the concepts of "no waste" and lean farming methods, which means we only grow what we think we can use or sell. Overproduction is a waste of resources like water, soil, and especially time. We keep careful watch on our crops as they are growing, so that we do not lose crops due to lack of fertility, water, or pest damage. We do periodic checks to make sure we are not "spinning our wheels" and doing things that are wasteful. While we do our best to harvest everything we grow, fruits or vegetables that are not harvested either because of damage or not being sold in time are composted on site or left in place, when appropriate, to provide food for birds, insects, and critters in the soil. Did you know that hummingbirds not only sip nectar, but they need a protein source? The small flies on a piece of fallen fruit can feed lots of birds! We are happy to partner with our local food pantries and recovery groups to reduce food waste. After each farmers market, we donate unsold produce to a local food recovery group, which is then distributed to local food banks. We have a selection of produce available to restaurants, breweries, institutions and distributors. Orders can be placed for Delivery or Pickup and we can accommodate both small and large orders. Come meet us at a local market and buy our produce! We have select offerings for domestic mail order. Visit our online store for current offerings!